Biola selected for list for scoring "high marks in both showbiz and academic circles"
Biola University’s Cinema and Media Arts (CMA) program was listed as one of 40 best film schools around the world by Variety’s Entertainment Education Report. Schools selected for the list “score high marks in both showbiz and academic circles,” according to Variety. Biola’s program has experienced growth over the past few years with a record number of applications received for Fall 2017. The program currently offers concentrations in media management, production, and writing for film and television. Students are also provided 24-hour access to a 10,000 square-foot production center complete with sound stage, recording room, and video and audio editing facilities. In July 2018, the School of Cinema and Media Arts will be launched as Biola’s ninth school. 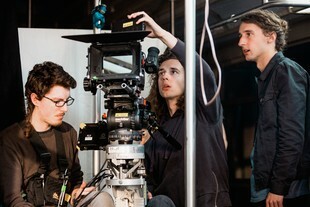 With the establishment of the new school, the program will introduce 17 new undergraduate degrees and concentrations to be introduced over the next five years in areas such as acting, film scoring, cinematography and directing. Biola hopes these new programs will attract nearly 750 new students by 2027. The new 50,000 plus square-foot facility will house a screening room capable of seating 220, several sound stages, a Foley stage, recording and editing rooms, five classrooms and 23 faculty and staff offices. Biola has already nurtured the development of many great film professionals like writer and director Scott Derrickson (’90) and filmmaker and influencer Zach King (’12). Derrickson is known for box office hits like “Doctor Strange,” “The Day the Earth Stood Still,” and “The Exorcism of Emily Rose.” King is known for his video illusions. His work has landed him interviews on the Ellen DeGeneres Show, Good Morning America and in People magazine. He has also worked to produce commercials with well-known companies and brands, such as Sony, LG Electronics, and Buick. In addition, Biola CMA alumni have achieved notable accomplishments. Alumnus Matt Hawksworth’s (’12) short film was picked up to be directed by “Lost” and “Cloverfield” cinematographer, Michael Bonvillain. Alumnus Jeffrey Prosser (’15) was featured in VoyageLA Magazine for his work. Lastly, alumnus Jose Ordonez (’16) was selected for the 25 under 25 Film Festival. Learn more about Biola’s new School of Cinema and Media Arts. For more information and press inquiries, contact Jenna Loumagne, manager of media relations, at (562) 777-4061 or jenna.loumagne@biola.edu. In this post, we will be listing five technical Search engine optimisation tricks to enhance organic website traffic, rankings and revenues.